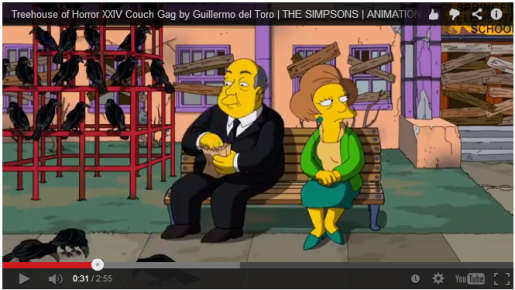 A reference-filled couch gag from Guillermo Del Toro. Guillermo Del Toro is one of the busiest people working in the movie industry these days, full stop. He might not have gotten to do The Hobbit like he wanted, but that doesn’t mean he’s not keeping busy. He’s put out Pacific Rim, a love letter to Japanese monster movies, and now he’s got another achievement under his belt. Guillermo Del Toro has done the “couch gag” for The Simpsons “Treehouse of Horror XXIV”. Let’s watch, shall we? As it turns out, not only did Del Toro draw inspiration from his own movies and horror classics like The Shining, he also drew a lot of inspiration from an unusual source: Mad Magazine. That’s right, Mad artists like Will Elder, Mort Drucker, and Harvey Kurtzman inspired Del Toro to cram as many references into his video as he possibly could. And believe me, if you pause the video at any point, you’ll see something you never would’ve noticed. Someone’s finally topped Banksy’s couch gag in terms of its awesomeness.